I’m currently having thrifting withdrawals, so I thought that this would be a perfect Monday post! Before I graduated school and began my career, I had a lot more free time during the day.. which means A LOT of thrifting took place. During this time, I was able to quickly figure out what I believe are the best times to thrift! Week Day Mornings: Now that I’m working a full time 9-5, I usually don't get to enjoy thrifting on week day mornings. :( However, if this time frame is open for you..you will easily see why it’s one of my favorite times to thrift. Most people are usually at work or school during this part of the day, so you’ll find that you basically have the entire store to yourself! Everything hasn't been super rummaged through yet and you'll have first dibs. Whenever I have my next day off, you’ll definitely find me thrifting in the morning. Half Off Days: Now you know why I enjoy thrifting in the mornings, but if it also happens to be half off Wednesday….I’m literally in thrifting heaven! Most thrift stores will advertise half off days for holidays or special occasions like back to school sales. One of my favorite thrift stores actually has a half off sale every single Wednesday! If there's no half off everything sale going on that day, still be sure to check at the front of the store to see if any specific colored price tags are half off for the day. Now it’s not like thrift store prices aren’t already low…but if you can now get a $20 coat for $10…. why not take advantage?! The Day After Restock: Stopping by the thrift store and noticing that the stock is super low can be pretty annoying. Ask one of the store employees to let you in on what day they restock! 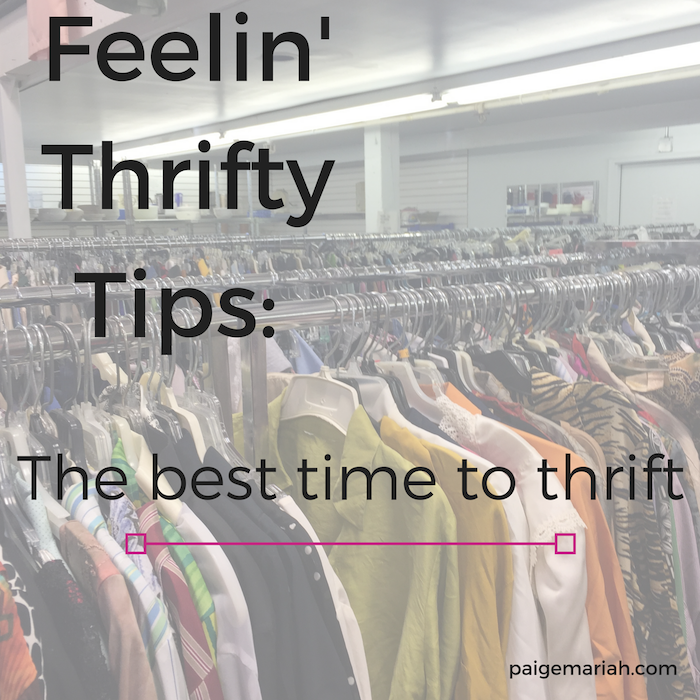 From now on, you can make sure that you only thrift on a day when the store has plenty of clothes and accessories to choose from! No more leaving disappointed!